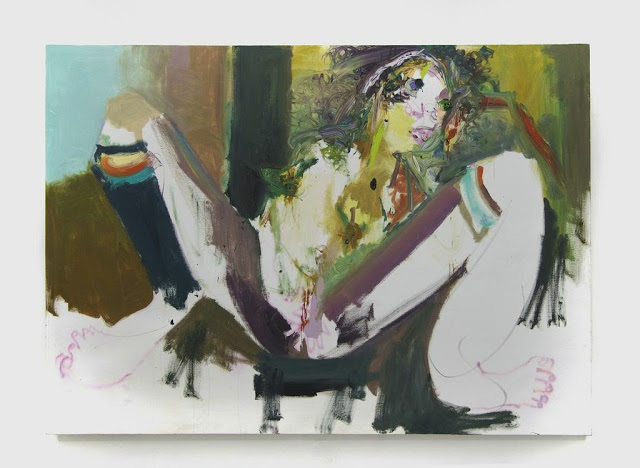 In the second installment of their “Four Paintings” series, Regina Rex presents four huge figurative paintings, one each from accomplished artists Hannah Barrett, Linda Gallagher, Becky Kinder and Summer Wheat. 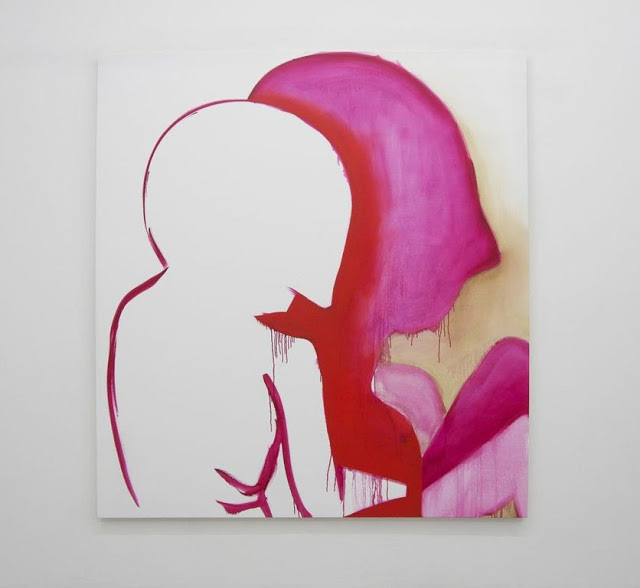 Stroking herself and gazing over her shoulder outside the picture toward the neighboring wall, she is perhaps fantasizing about the red-pink, loosely painted alien-like silhouette painted on the next canvas over. 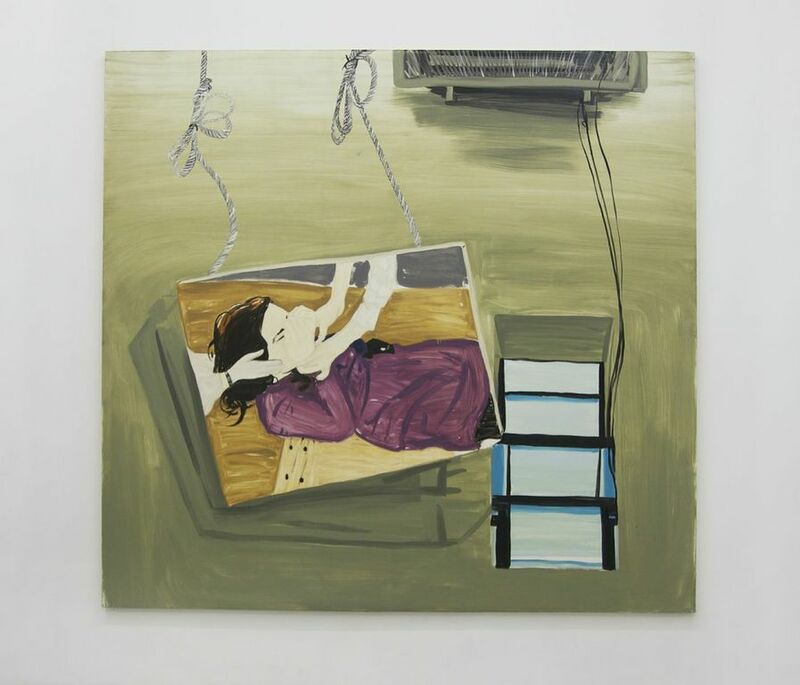 Becky Kinder, Untitled, 2011, oil on canvas, 88 x 80 inches. He or she turns away from the genitalia, facing the canvas on the next wall–a picture-within-a-picture that we are told references Lars Von Trier’s 2000 award-winning musical-dramatic film Dancer in the Dark. The painting features a cropped assortment of objects, perhaps items scattered about the artist’s studio, and a photograph (film still?) of a lady lying on the ground with her hands over her mouth. Although I’ve never seen the film, I learned from a Google search that Dancer in the Dark is about a woman (played by Bjork) who is slowly going blind and (spoiler alert) dies at the gallows after she is convicted of murder and treason. Linda Gallagher, Selma, 2009, oil on canvas, 96 x 90 inches. Looking toward the matronly but androgynous figure on the fourth wall, the Lars Von Trier woman completes the circle. 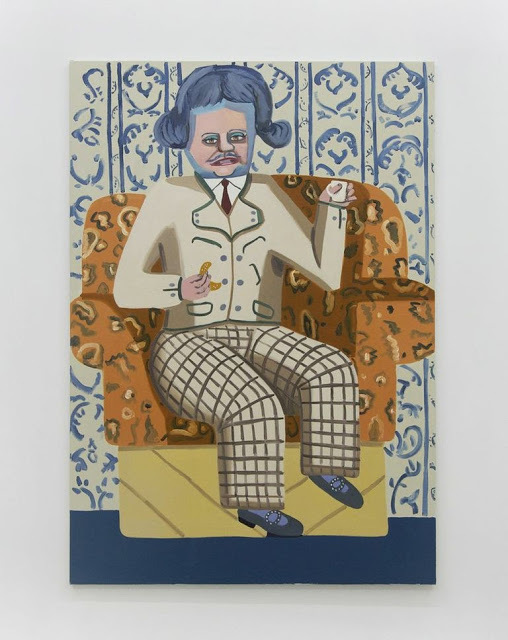 Sitting on a big easy chair that rests atop a crate, the final figure, sporting a Thatcher-esque helmet hairdo and Mary Jane shoes, stares defiantly at the viewer, a biscuit in one hand and a diminutive teacup in the other. Hannah Barrett, Small Brown One, 2013, acrylic and oil on canvas, 72 x 50 inches. For the most part, the solitary figures in the paintings resist the viewer’s presence, carrying on despite the occasional visitor. It occurs to me that the show, in its determined obliviousness and defiance, could be an apt allegory for the artworld’s relationshp to the general public. Summer Wheat , Scratchpad, 2010, acrylic and oil on canvas, 96 x 72 inches. I saw socks like that at MoMA once. Thank you for this review. Looks like a beautiful show. Oh dear! One sock on and one sock off, you will catch cold.